This leads us to the UNHRC’s irredeemable flaw: Its institutional biases are so skewed in favor of murderers, dictators, and bigots that it serves primarily to legitimize the dregs of the earth. The Council has a permanent agenda item—item seven—which obliges it to regularly survey potential abuses committed by Israel in the Palestinian territories. Item seven is such a blatant misuse of the Council’s time that Europe and North America boycott the group when that article is invoked. In 2008, the commission appointed Richard Falk, a 9/11 conspiracy theorist and Hamas apologist, to serve a six-year term as a United Nations Special Rapporteur for the human rights situation in the Palestinian territories. In 2011, Falk was reprimanded by UN General Secretary Ban Ki-moon for endorsing the idea that the U.S. was behind the attacks on its own territory. Jean Ziegler, co-founder of the Muammar Qaddafi International Prize for Human Rights—which is a real thing that has been awarded to such paragons as Hugo Chavez, Fidel Castro, Recep Tayyip Erdoğan, and Louis Farrakhan—currently serves in an elected role on the United Nations Human Rights Council. The Council’s special rapporteur on “unilateral coercive measures,” Idriss Jazairy, is alleged by UN Watch’s Hillel Neuer in testimony before Congress to have executed an “aggressive campaign of non-democracies to muzzle UN rights experts.” One of Jazairy’s most recent reports to the UNHRC is a typical jeremiad attacking the civilized world for maintaining strict sanctions against Bashar al-Assad’s government as punishment for Damascus’s use of genocidal tactics and chemical weapons on civilian populations. Despite Haley’s earned hostility toward the United Nations for its biases against both Israel and the general appearance of sanity, she has proven to be a particularly effective ambassador. Last week, amid a rote condemnation of the Jewish State for engaging in targeted self-defense amid a flare up on its border with Gaza, Haley managed to expose something new: cracks in the UN’s anti-Israel consensus. As a thought experiment, one may consider, “What was Israel to do?” It is a shame that there were innocent civilian casualties and injuries — Palestinians that did not take part in the violence were harmed. It is important, however, to make a clear distinction that Israel did not see these protests as an opportunity to kill as many Palestinians as possible. These protests, especially when they turned violent, thrust Israel into a position to defend its border. Of course, Israel and Palestine have differing stories on the militant status of the protestors killed. During the protests, the IDF has been running a live twitter feed of their defensive actions with video recordings for reference. In addition to this, the IDF have on several occasions dropped leaflets from aircraft warning protestors not to approach the border fence. In response to the Israeli defense, Hamas fired approximately 100 rockets toward heavily populated Israeli towns and cities. The Iron Dome Missile defense system was able to prevent the projectiles from causing any civilian casualties. Again, the UN failed to make any mention of this in their latest condemnation towards Israel, even after the United States proposed an amendment enumerating such. In the UN general assembly chamber, Turkey, Algeria, and Palestine, some of Israel’s most outspoken critics, proposed a resolution condemning Israel for “excessive use of force.” The Palestinians also formally requested heavier security apparatus to defend themselves against the Israelis. A majority of countries also chose to neglect the defensive position Israel maintained or any mention of Hamas’ involvement. The only nations that voted against this measure were Australia, the Marshall Islands, Micronesia, Nauru, Solomon Islands, Togo, the United States, and Israel. The greater community of the United Nations chose to forgo objectivity, and opt for a one-sided narrative. A few days ago (here) I analyzed the recent UN General Assembly vote on Gaza and concluded that the UN’s automatic majority against Israel is fraying. I will say that we share the view that a dedicated agenda item focused solely on Israel and the Occupied Palestinian Territories is disproportionate and damaging to the cause of peace and unless things change, we shall move next year to vote against all resolutions introduced under Item 7. Thus the British are now saying they will next year automatically vote against any and every resolution brought under this agenda item, regardless of its content. Britain’s move is likely to open the door for others in the EU or the Commonwealth to follow suit, or at least give Israel and the United States a powerful new argument against that agenda item that singles out Israel. There are some good candidates on the Human Rights Council who ought to follow the UK–and, it should be said, Australia, which already takes this position. Among them are Belgium, Germany, Hungary, Slovakia, Slovenia, Spain, and Switzerland in Europe and Japan outside it. They should be the targets of an American and Israeli campaign for some basic standard of fairness. The alternative will be the withdrawal of the United States from the Human Rights Council. Having criticized the Foreign & Commonwealth Office recently (in this blog post) it is only fair to give credit where it is due. Hat’s off to Johnson and the FCO on this one. 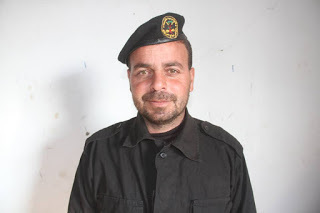 Murder an Israeli and become famous – that is the repeated message from the Palestinian Authority to Palestinians. The PA has reiterated this again by naming a plaza in the Palestinian town of Tulkarem after Israeli Arab terrorist prisoner Maher Younes who, together with his cousin, Karim Younes, kidnapped and murdered Israeli soldier Avraham Bromberg in 1980. Both murderers were sentenced to life imprisonment, which was commuted by former Israeli president Shimon Peres to 40 years. The Palestinian leadership’s rejection of normalized relations with Israel that were established in 1993 with the Oslo Accords has created an economic void, hurting the Palestinian public. The Oslo vision has been undermined, largely because of measures by the Palestinian leadership to publicly shun Israeli-Palestinian economic cooperation and stifle domestic Palestinian business initiatives and innovation. Without the existence of a viable independent economy, or government encouragement of the joint initiatives laid out in the Oslo Accords, many Palestinians in the West Bank have become largely dependent on Israel and private Israeli business and industry for their economic livelihoods. In short, the Palestinian leadership has quashed any major joint initiatives between Israelis and Palestinians intended to benefit both publics. This unfriendly business environment has also discouraged foreign investors. The Palestinian leadership and its NGO partners and supporters have distracted the international focus from addressing Palestinian economic development, liberalization, and infrastructural development. Unlike much of the developing world, the Palestinian leadership has refused to develop its economy in conjunction with its economically thriving Israeli neighbor, who is potentially the prospective Palestinian state’s strongest trading partner. Thus, the Palestinian leadership has been complicit in its own economic stagnation. The Palestinian leadership would be well advised to follow the lead of its citizenry and cooperate closely with its Israeli neighbor, learning from and adapting to the Start-up Nation culture that Israeli entrepreneurs have attempted to share with Palestinian colleagues in an effort to forge a better common future. A Palestinian official has condemned reported U.S. plans to secure funding from Persian Gulf states for major economic projects in the blockaded, impoverished Gaza Strip. Nabil Abu Rudeineh, spokesman for Palestinian Authority President Mahmoud Abbas, claimed Monday that such efforts aim to further distance the Gaza Strip, ruled by Hamas, from the West Bank, ruled by Abbas’ Fatah. The rival factions have been at odds since Hamas violently routed Fatah from Gaza in 2007. Facing hostility from Gaza, Israel has prevented most travel between Gaza and the West Bank for security reasons. U.S. President Donald Trump’s adviser and son-in-law Jared Kushner is expected to visit Israel, Egypt, Jordan, Qatar and Saudi Arabia this week to discuss the situation in Gaza and present the administration’s proposals for an Israeli-Palestinian peace agreement. Abbas severed contact with the U.S. administration in December to protest what he says are its blatantly pro-Israel policies, chiefly Trump’s official recognition of Jerusalem as Israel’s capital. The Palestinians envision parts of Jerusalem as the capital of a future Palestinian state. 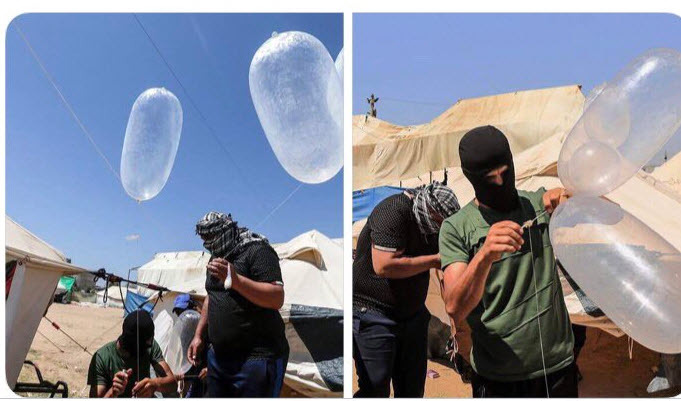 Since March, Hamas-led terrorists in Gaza have been setting fire to Israeli lands, using fire kites and explosive balloons. Hamas dedicates all its efforts to spreading terror, hate & violence against Israel. Hamas is sowing nothing but destruction. But seriously, if only they applied their inventiveness and creativity towards the pursuit of productive goals and things benefiting mankind. Then they might be able to emulate Israel. Numerous Agence France-Presse photo captions in the last couple of days misidentify Gazans responsible for airborne arson attacks which destroyed 28,000 dunums of Israeli farmland and nature reserve land. The smoke from these deliberately set fires two days ago caused 1000 turkeys to choke to death. The arsonists also launched explosives-laden kites and balloons across the border, reaching a highway and even the roof of a home. French President Emmanuel Macron last week directed his United Nations representative to vote in favor of a General Assembly resolution calling for international protection for Palestinians within the context of denouncing Israel’s response to the so-called “March of Return” protests which ended in more than one hundred deaths, but which notably failed to mention the role of Hamas—recognized as a terrorist organization by the U.S. and European Union—in planning, fomenting and directing the violence in the Gaza Strip. France was joined by Belgium, whose capital is the seat of the EU. Although choosing not to back the Israeli position, France’s European neighbors Germany and the United Kingdom elected to abstain, presumably because of the obvious lack of balance if for no other reason. Although France only moments earlier had voted in support of an amendment to the resolution offered by the United States that attributed blame to Hamas, the motion failed after receiving a plurality but falling short of the required two-thirds majority. Only weeks before, France had voted in favor of a Kuwaiti-drafted Security Council resolution which except for a U.S. veto, would have mandated the deployment of an international force to Gaza expressly to protect the Gazans. This, despite the “get home free card” to abstain rather than support the measure—as did London and Berlin—so vehemently opposed by its allies in Jerusalem by virtue of U.S. Ambassador Nikki Haley’s promise to cast the American veto. Israel has managed to secure a written pledge from four successive U.S. presidents to safeguard its presumed nuclear deterrent, The New Yorker magazine reported on Monday. According to uncorroborated reports in the foreign media, Israel has as many as 200 nuclear warheads as part of a presumed military nuclear program dating back to the 1960s. Israel has never publicly acknowledged these reports. Israel has also pledged not to be the first nation to introduce nuclear weapons in the region. According to Monday’s report, in the wake of the first Gulf War in the early 1990s, Israel felt that the unwritten understanding struck between President Richard Nixon and Prime Minister Golda Meir in the early 1970s to ensure Israel would never be compelled to denuclearize was insufficient. Eventually, Israeli policymakers convinced President Bill Clinton to put the Nixon-Meir understandings into writing. “The first iteration of the secret letter was drafted during the Clinton administration as part of an agreement for Israel’s participation in the 1998 Wye River negotiations with the Palestinians,” said the report, by The New Yorker’s Adam Entous. In the wake of the Singapore summit with North Korea, many commentators and publicists, Democrats as well as figures from the NeverTrump Right, have argued that President Trump is legitimizing a dictator. Trump critics contend that had President Obama met with a dictator like Kim Jong-un, Republicans would be fuming. After all, Republicans criticized the previous president for negotiating with another despotic regime, Iran, over its nuclear weapons program. Accordingly, honesty and principle require Trump supporters to criticize the current president for doing precisely what would merit attacks on a Democratic president. A cursory glance shows that the two situations are not at all similar. Iran does not yet have a viable nuclear weapon and North Korea does. The negotiations that led to Obama’s signature foreign policy initiative, the Joint Comprehensive Plan of Action, legitimized Iran’s path to the bomb, achievable within a little more than a decade. The purpose of Trump’s negotiations is to denuclearize the Korean peninsula. Clearly, Democratic and NeverTrump political operatives are not making a serious argument. They’re posturing. Since this is a deadly serious issue, however, it’s worth getting it right. It’s vital to understand that Obama’s Iran deal wasn’t simply or even primarily an arms agreement. Rather, it was an instrument with which to realign American interests in the Middle East. The goal of realignment was to upgrade Iran and downgrade traditional American partners—especially Israel and Saudi Arabia—in order to facilitate a U.S. withdrawal from the region. Israeli Prime Minister Benjamin Netanyahu made an unannounced visit to Amman on Monday for a meeting with King Abdullah II, with the two leaders discussing “regional developments, advancing the peace process, and bilateral relations,” according to a statement released by the Israeli leader’s office. The trip comes as top White House envoys Jared Kushner and Jason Greenblatt are set to arrive in the region, a tour that will take them to Saudi Arabia, Egypt and Qatar, as well as Jerusalem and the Hashemite Kingdom. The American officials are expected to discuss when to present an 18-months-in-the-making Israeli-Palestinian peace plan, as well as seek ideas on how to solve the crisis in the Gaza Strip. In this respect, a spokesperson for Palestinian Authority President Mahmoud Abbas already poured cold water on the Trump administration’s highly-anticipated peace proposal, describing the initiative as a “waste of time” that is “bound to fail.” Senior Abbas aide Nabil Abu Rudeineh likewise rejected Washington’s plan to rehabilitate Gaza, claiming that the move to raise hundreds of millions of dollars for the Palestinian enclave is guided not by humanitarian concern but, rather, geared towards creating a larger rift between the Hamas-ruled territory and the Abbas-ruled West Bank. Perhaps more acute, then, are developments in Syria, where pro-Assad regime forces are in the initial stages of what is expected to be a major offensive to retake rebel-held areas adjacent to both the Israeli and Jordanian borders. To this end, Amman is party to a ceasefire agreement devised last year in conjunction with the United States and Russia that created so-called “de-escalation” areas in southwest Syria. Although there has since been little fighting in the effective buffer zones, the Assad regime, emboldened by its recent consolidation of control over Damascus, now aims to re-assert military dominance along the frontiers. The US envoy for Israeli-Palestinian peace on Tuesday hailed Prime Minister Benjamin Netanyahu’s meeting the previous day with Jordan’s King Abdullah II, ahead of his visit to the region to promote the American proposal. “Happy to see King Abdullah and Prime Minister Netanyahu resuming meetings with regard to key issues. Very important to both countries and to the entire region,” Jason Greenblatt tweeted. Greenblatt and Jared Kushner, US President Donald Trump’s senior adviser and son-in-law, are set to visit Qatar, Saudi Arabia, Egypt, Jordan, and Israel this week ahead of the expected unveiling of Trump’s plan to broker Mideast peace. Netanyahu traveled Monday to Amman to meet with Abdullah for their first publicly confirmed meeting in four years. “The king and the prime minister discussed regional developments and advancing the peace process and bilateral relations. Prime Minister Netanyahu reiterated Israel’s commitment to maintaining the status quo at the holy sites in Jerusalem,” Netanyahu’s office said in a statement. The rare meeting came after months of strained ties between Jerusalem and Amman over the killing of two Jordanians by an Israeli embassy guard. Iranian internet activists posted Twitter comments for and against Gonen Segev, the former Israeli government minister, in the wake of the Israeli government’s June 19 announcement that Segev had been arrested on charges of spying for Iran. While official Iranian media sources have been restrained in their coverage of the announcement, doing little more than citing Israeli sources, including The Jerusalem Post, Twitter users shared their visceral reactions with the hashtag #FreeGonenSegev, which had been tweeted some 4,500 times as of midnight that day. Many of the Twitter comments deride Israel and Prime Minister Benjamin Netanyahu for allowing the alleged spy to operate in their midst. Israel, not the US, was responsible for a strike on Syrian regime linked positions near the Iraqi border, a US official told CNN on Monday. Earlier, Syrian state media said that US-led coalition aircraft had bombed the position, causing deaths and injuries. The commander, who is not Syrian and spoke to Reuters on condition of anonymity, said the strike had killed and injured some Iraqi fighters but he did not give any numbers. Iraq’s Popular Mobilization Forces, a grouping of mostly Iran-backed Shi’ite paramilitaries, said a US air strike on the Iraqi border with Syria killed 22 of its members and wounded 12 others. Hundreds of police and soldiers were mobilized this week for the evacuation and demolition of five illegal structures in the Bedouin settlement of Susya in the southern Hebron hills, in Area c, which, according to the Oslo Accords, is under complete Israeli control. But on Monday night, according to Ynet, the prime minister’s office was instructed to postpone the evacuation to an undetermined date. The reason, Ynet speculates, is the coming visit of Jared Kushner and Jason Greenblatt, President Trump’s envoys to the peace negotiations. The fight against the demolition of Arab homes in Susya is one of the symbols of the PA struggle against Israel’s authority over Judea and Samaria, and the Netanyahu government has been under heavy international pressure, especially in recent weeks, to prevent the demolition, which is expected to receive extensive international coverage. Meanwhile, unafraid of international rebuke over destroying Jewish property, over the past week Israeli security forces evacuated two Jewish neighborhoods in Judea and Samaria: Netiv Ha’Avot in Gush Etzion and Tapuach West in Samaria. A court on Tuesday threw out a confession given by a teenage accomplice accused of involvement in the deadly 2015 firebombing of a Palestinian home in the West Bank town of Duma, saying in a dramatic ruling that the statement had been given under duress. The decision creates a major hurdle for the prosecution, which may now need to throw out the case against the unnamed minor accused of helping plan the firebombing of the Dawabsha family home on July 31, 2015, which killed toddler Ali Saad Dawabsha and parents Riham and Saad Dawabsha. Another son, Ahmed Dawabsha, who was 5 at the time, underwent months of treatment for severe burns sustained in the attack. Knesset Member Ayman Odeh, leader of the Arab Joint List, participated Monday in an east Jerusalem conference on behalf of two Palestinian organizations which have been defined by Israel as terror groups, the Popular Front for the Liberation of Palestine (PFLP) and the Democratic Front for the Liberation of Palestine (DFLP). Several hours earlier, Jerusalem District Police Commander Maj. Gen. Yoram Halevy signed a prohibition order against the conference. Police officers arrived at the Ambassador Hotel in east Jerusalem to stop the event from going ahead. Six people were detained for questioning and one woman was arrested. The conference was supposed to focus on the issue of Jerusalem as the capital of the state of Palestine. The Russian Embassy in Israel, however, denied that the conference marking Russia Day was initiated by the two Palestinian terror organizations. The embassy said in a statement that the event was held by the Society of Palestinian-Russian Friendship. Egyptian President Abdel-Fattah el-Sissi has reportedly ordered that the Rafah crossing on the border with the Gaza Strip remain open for humanitarian reasons until the Muslim festival of Eid al-Adha in late August. Egypt had already opened the crossing longer than any other time in recent years, after last month it granted access in both directions for the entire month of Ramadan. On Tuesday, Egyptian security sources, quoted by local media, said people and goods will be able to pass through the crossing for another two months to ease the burden on Gaza’s population. For years, Egypt opened its sole border crossing with the Gaza Strip only sporadically and for short intervals, as it has fought an insurgency in north Sinai bordering the Palestinian enclave. Eid al-Adha, or the “Festival of Sacrifice,” is planned to be marked this year by Muslims worldwide on August 21-25, although the exact dates may vary. American lawmakers are very slowly waking up to the scam, which may be why Gen. Aoun is rushing to D.C. In recent weeks, for instance, Sen. Ted Cruz introduced language into the National Defense Authorization Act (NDAA) for fiscal year 2019 trying to establish accountability. It was reportedly a bipartisan compromise agreed to by both the majority and minority on the Senate Armed Services Committee. A British push to fully ban Hizbullah could have a domino effect throughout Europe, analysts say. On Tuesday, the Jewish Chronicle reported that United Kingdom Home Secretary Sajid Javid would ban the Lebanese Shiite group’s political wing by the end of 2018. The report, citing an unnamed senior Conservative source, claimed that Javid has vowed to take “decisive action” against Hizbullah, which is backed by Iran. The decision reportedly came following last weekend’s anti-Zionist “Quds Day” march through central London, in which some protesters waved the bright yellow Hizbullah flag. Though viewed entirely as a terrorist group by the United States, Canada, Israel, the Netherlands and the Arab League, only the military wing of the Shiite organization is outlawed in other EU member states. “It is important that the international community take a very clear stance on how it views Hizbullah because as long as the group is not boycotted in a clear way, it is legitimized in Lebanon,” Eran explained, adding that the ban could lead other European nations to follow suit. Campaign Against Antisemitism is appalled by the utterly shameless response of the Home Office to our Parliamentary Petition calling for the full proscription of Hizballah. The petition, which has been signed by well over 14,000 people, from all but one of the UK’s 650 Parliamentary constituencies, calls for the full proscription of Hizballah as a terrorist organisation under the Terrorism Act 2000. Currently, the British Government lists only the “military wing” of Hizballah as a terrorist organisation, despite even Hizballah openly mocking the distinction. As our Parliamentary Petition passed the 10,000 signatures needed to force the Government to respond, we also made written representations to the Home Secretary, Sajid Javid. Without wishing to go into detail, we came to the conclusion that Hizballah would be proscribed. In a separate letter from the Home Office that we have seen, the Rt Hon. Nick Hurd MP, Minister of State for Policing, noted that Hizballah provides “social and political functions”, but that does not negate the fact that the entirety of Hizballah seeks the annihilation of Jews and actively promotes its own campaign of terrorism that, according to Hizballah’s own statements, are conducted by one united Hizballah which does not have distinguishable political and military wings. The celebrations are not just about the glorification of guns and killing for national or religious purposes. The events are also marked by historic revisionism in which the genocide victims are blamed for their own extermination. There are many factors that drive the hysteria in Turkey extolling deaths, killings and attempts to brainwash children and turn them into “voluntary martyrs”: Systematic racism, ultra-nationalism, Islamic jihad and belief in martyrdom as well as the denial of the Christian genocide combined with pride in having waged it. The 2015 “Islam Law” of Austria, which Erdogan was protesting, states that “The freedom of religion is secured in the Austrian Constitution – individually, collectively and cooperatively” — and that this freedom should not be allowed to be exploited by those who incite hate or violence for any group.